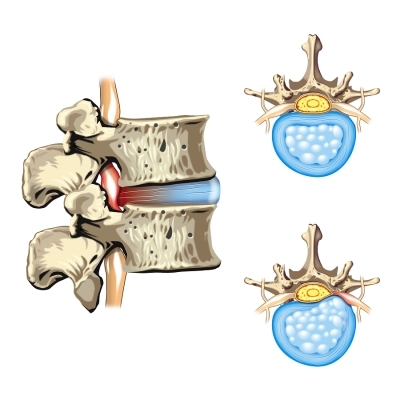 Home / Blog » What Are Some of the Most Common Reasons for Revision Spine Surgery? Pseudoarthrosis is a fairly common problem among patients who previously underwent a spinal fusion surgery, which fuses two or more vertebrae together. Typically, the bone is expected to fuse within the first year after the spine surgery. When this fails to occur, the condition is referred to as pseudoarthrosis. Pseudoarthrosis may be more likely to occur among patients who smoke or take corticosteroids, along with those who did not receive any implanted hardware during the initial surgery. If you’ve had spine surgery to address symptoms caused by disc herniation, you should be aware that there’s a possibility you’ll suffer another disc herniation in the future. Disc herniation occurs when the material on the inside of this soft, flexible structure protrudes through the exterior, where it can impinge upon nearby nerves. Normally, when spine surgeons perform a discectomy, they only remove the fragments of material that have protruded out from the disc. Since the disc itself remains, it is possible that additional material will later protrude from the structure. Adjacent segment disease (ASD) is also sometimes referred to as adjacent segment degeneration. It involves changes to the structure of the spinal joints that are located either below or above the initial surgery site. This may occur due to increased stress exerted on these areas; however, the exact causes are still under investigation. It is not very common for spine surgery patients to experience a malfunction of the implanted hardware. However, it is possible for these devices to break on occasion. It is also possible that the hardware may be in the wrong position. Other patients experience painful hardware syndrome, which may arise from the soft tissue around the devices. In the case of a hardware malfunction, patients may undergo revision surgery to remove the devices and replace them.